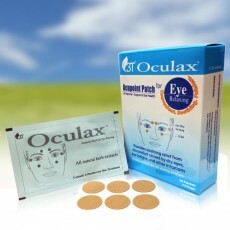 Oculax Acupoint Patch is a natural eye care product that provides relief from eye strain, helps to alleviate blurry vision, and supplies sufficient moisture for dry eye. It is also designed to soothe eye irritations caused by various eye disorders due to: computer use, Lasik surgery, age, etc., improve blood circulation, alleviate muscle spasms, and promote nutrient and moisture absorption around the eyes. 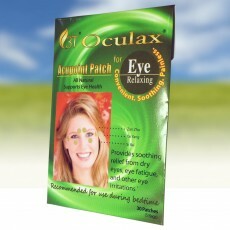 Oculax is a non-invasive approach to eye relaxation and ..
Oculax Acupoint Patch 5 bag/pack ..